Discover paradise on earth at Grand Park Kodhipparu, a luxurious one-island-one-resort destination. Daily buffet breakfast for 2 persons at The Edge. Access to the Beach Club facilities - Table Games, PlayStation, Gymnasium, Steam Room and Kids’ Club. The rate is subject to 10% service charge, 12% goods & services tax (GST), and green tax of USD6 per person per night. The rate quoted is per night for 2 (two) guests and is subject to availability, seasonal variations and may change without notice. Mandatory speedboat transfers are priced at USD 180 net per adult and USD 90 net per child. Flight details must be provided 48 hours prior to arrival to arrange the transfers. Speedboat transfers provided by the resort are mandatory. Third party boat transfers are not accepted to and from the resort, for both arrival and departure. All excursions and trips must be booked with the resort. As per their internal safety policy, third party bookings for excursions and trips are not allowed for the resort guests. The above benefits cannot be combined with any other discount or exchanged for any other service or cash. Wake up to the beautiful sunrise in the private ocean water villa, located near the island facilities and offers limitless views of the sky and sea. Also features a private terrace with sun lounger, inviting steps to the underwater world as well as an expansive bathroom with indoor and outdoor shower. Set amidst calm crystal clear lagoon facing North of the island, the private sunset villa is perfect for a dip or swim around the shallow waters on the island. 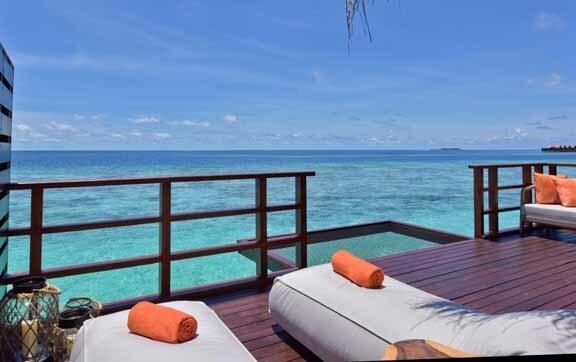 Unwind at the spacious private sun terrace or simply lie on the Maldivian hammock to bask in the sun. The lavish ocean pool water villa, enveloped by cerulean water and endless sea views is an escape to another world. 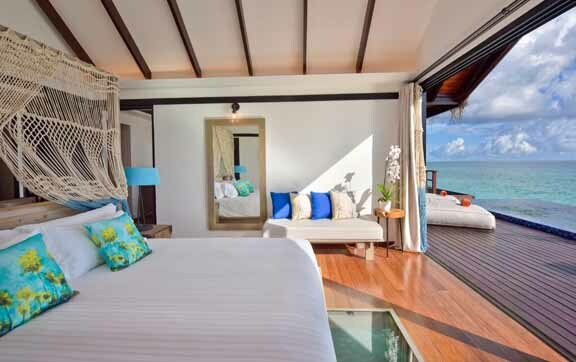 Facing the sea, this sunrise overwater villa also features a private pool, allowing you to slip into the tranquil waters as and when you like it. Experience paradise on earth at Grand Park Kodhipparu, Maldives. A luxurious one-island-one-resort destination featuring a collection of 120 idyllic beach-front pool villas, breathtaking overwater villas and spacious two-bedroom villas. Embark on a 360° barefoot island adventure and immerse in the tranquility that nature has to offer. Soak up the sun by the infinity pool, delight in delectable cuisine at any of our 3 restaurants & bars or simply take in the splendour of the vast azure sea, home to a variety of colourful and exotic marine life. Just a mere 20 minutes’ speedboat ride from Male, barefoot luxury and the stunning beauty of Maldives awaits you. 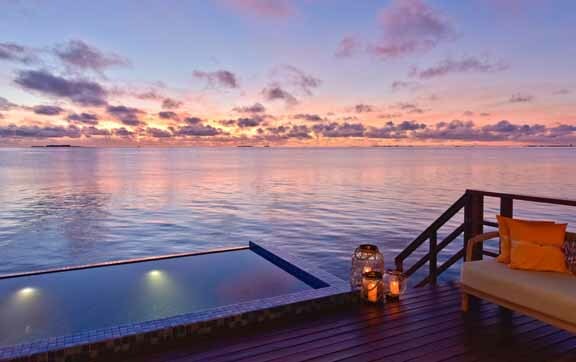 This idyllic address is located on the North Male Atoll, renowned for its thriving coral and marine life and proximity to some of the world’s best diving sites. 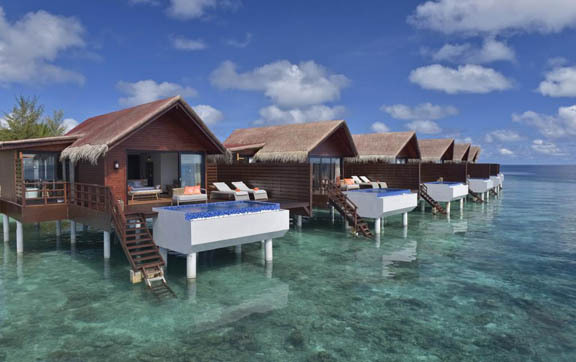 The resort is just a mere 20 minutes’ speedboat ride from Velana International Airport, Male, the capital of Maldives. Be welcomed by our dedicated Airport Representative Team upon arrival at the airport. With the nature of the Maldives described as strings of pearls with islands stretching from north to south, the main transport would be by air to arrive to Velana International Airport. The airport is just two kilometres across the water from the capital, Malé. There are many scheduled flights in partnership with more than 20 airlines around the world and you may check with your local travel agent for more details. As we are uniquely located across water from the airport, roundtrip airport transfers, combined with other resort guests, will be required for scheduled flights. For your privacy and comfort, we will be able to arrange private speedboat transfer service on a roundtrip journey from/to Velana International Airport. Fresh flavours, light textures and irresistible views! 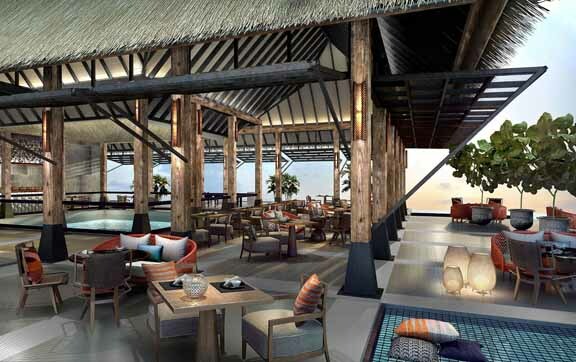 Introduce your palate to a plethora of robust flavours from around the world at the overwater restaurant – The Edge. For light menus and all day bites, refuel at the poolside restaurant Breeze. after sunset, Breeze transforms into a laidback bar with easy beats. For evenings that call for something more special, our specialty restaurant Firedoor fires up a mean grill with the day’s freshest produce and juicy prime cuts – all perfectly paired with a curated wine collection. Experience choice with the different market and grill nights as well as themed menus throughout the week. The possibilities don’t end here. We have an enchanting array of private dining experiences for that special occasion or if you need to impress. Situated next to the ocean, The Edge welcomes diners into its contemporary and open spaces designed to showcase unblocked views of its picturesque surroundings. 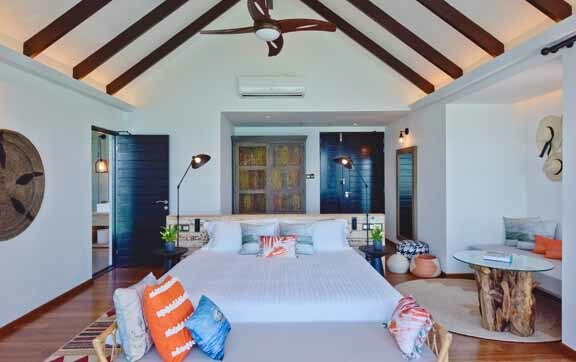 Maldivian influences are reflected in the pine wood timbre flooring, roof and ceiling features and extended to the furniture and décor items created by local craftsmen. A variety of seating from cosy indoor lounge seating to overwater private pods is available, ideal for group mingling or romantic dinners. Set against tranquil, panoramic ocean views, this laidback pool bar serves lunch and light bites throughout the day. Serving up modern, light menus with contemporary interpretations of Asian and Mediterranean classics, as well as old favourites like burgers, pastas and salads, Breeze is perfect venue to refuel throughout the day. At sunset, Breeze transforms into an easy-going resort bar where our inventive bartenders put together refreshing cocktails (and mocktails). Fine wines, classic cigars and light snacks also feature alongside some easy beats at sunset. Breeze is adjacent to the infinity pool with an adjoining cigar room. Extraordinary experiences for the romantic, the active and the family. There’s a lot you can do when in paradise or you can choose to do nothing at all. For the adventure enthusiast, Maldives offers a wide array of water sports and world class diving. 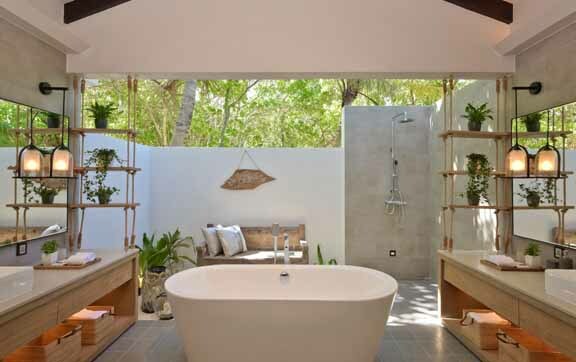 Honeymooners and couples can relish in couple spa journeys or themed private dining experiences. Families are also welcome as our well-equipped kids club and island activities will ensure the young ones are well taken care of. So truly, you can fill your days with fun and excitement, or enjoy moments perched on the white sand beach, enjoying the crystal waters as the day goes by. So whether it’s the luxury of doing nothing or setting off on a romantic sunset cruise and snorkeling among corals, you can be assured that our lifestyle hosts are here to fulfill your heart’s desire. And family holidays do not mean hanging around with the children in tow 24/7 – our kids club and babysitting services will provide valuable private time so that you get to enjoy Maldives to the fullest. Let the beauty of the Maldives enhance your dining experience in a very unique way! Maldives’ natural and beautiful landscape presents plentiful opportunities for many unique dining experiences. And how better to experience the destination than basking in the splendour of picturesque surroundings with our chef’s culinary creations from breakfast with champagne on a sandbank, an afternoon picnic at a private beach to an intimate gourmet meal in the privacy of your villa. Private dining experiences: Weekly tropical barbecue on the beach, dinner under the stars, candlelight dinner at your villa, dinner at the pergola, in-villa barbecue dinner, sunrise Champagne breakfast, sunset private cruise, sunset group cruise, picnic on the beach, sandbank sunrise breakfast, sandbank sunset picnic, movie under the stars and more. Check off your bucket list with a underwater experience like no other. Discover a dazzling underwater world in the North Male atoll, home to a myriad of marine species, renowned dive sites and sharks’ point. Our dive centre is fully equipped with what you require including a team of PADI certified professionals for a memorable diving experience. 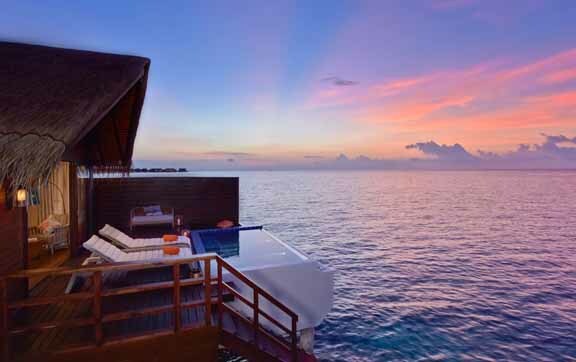 Embark on a journey to embrace Maldivian beauty. There’s a lot more to explore in Maldives; set aside time to embrace the beauty of the Indian Ocean with a selection of excursions specially organised by our lifestyle hosts. Start off with breakfast on dhoni (Maldivian sailboat) and then fish like a local before ending the day with a sunset cruise and dolphin sightings. Excursions: Morning fishing trip, morning dolphin cruise, snorkeling trip, sunset dhoni fishing trip, sunset dolphin watch and more. Water fun will never be the same. More action can be found at our water sports centre, a candy store for fans of the sun and sea. With an endless list of activities such as jet skiing, kayaking to wind surfing to choose from, sports aficionados would be kept occupied for days. Much to do but so little time, all under one roof for you. Located right next to the beach, this is the place to be for indoor entertainment. Comprising a gymnasium, sunrise yoga deck, games lounge and more, the clubhouse offers a multitude of opportunities for you to get together or get acquainted. The young ones can also check out our Little Explorers Club and be entertained by our list of tailored activities. A picturesque background for memories of a lifetime.Imagine yourself in the infinity pool with limitless view of the blue hues from the Indian Ocean and a blurry line from the horizon and the sea. Bliss will be the best word to describe it as you embrace the natural beauty of the Maldives while you sip on champagne, with lasting memories of the wonders of Nature.